There's a lot going on this month! Here's a quick rundown of where I'll be showing my work in the coming weeks. In all cases it's in the presence of several other talented artists who I feel honoured to share a wall with. I am really excited to see who else is in this show. 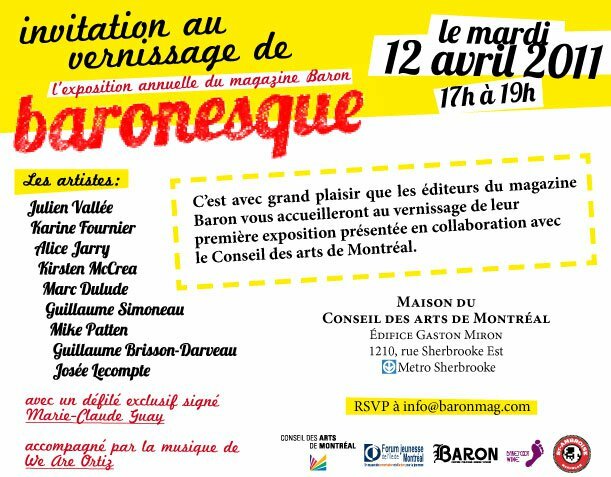 Local art magazine Baron celebrates one year of operation by putting on an exhibition of local contemporary art. 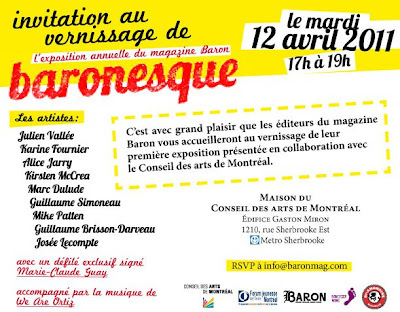 It opens Tuesday, April 12, 5 pm - 7 pm at the Maison des Conseil des Arts de Montréal, 1210 rue Sherbroooke. 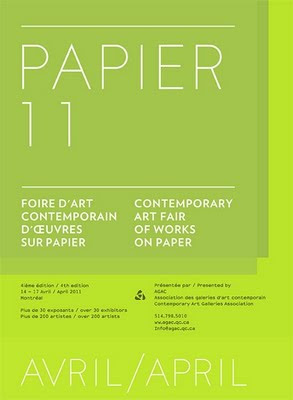 Papier is an art fair featuring works on paper. It is a rare opportunity to catch most of the city's major contemporary art galleries under one roof, and is, in my opinion, a not-to-be-missed event. I will have never-before-seen original drawings on display at the Maison Kasini booth, where I will also be displaying Papirmasse. If I get a chance I'm going to run off to the Galerie Pangée booth to paint with En Masse. 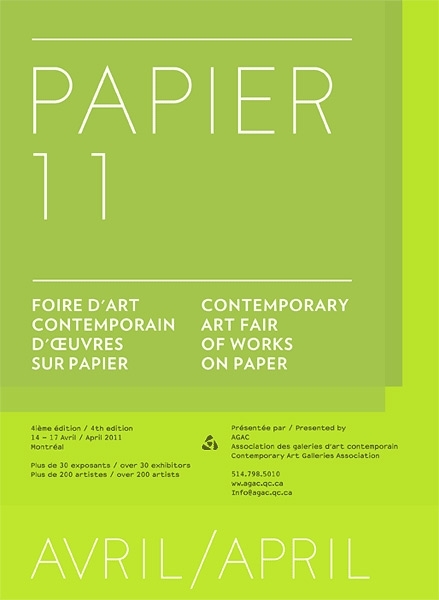 The Contemporary Art Galleries Association (AGAC) will open the 4th edition of PAPIER at the Place des Festivals, right in the middle of the Quartier des spectacles (coin Bleury & Maissonneuve), from April 14th to 17th 2011. 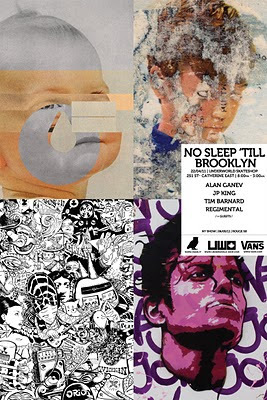 With less than a month away from their show in Brooklyn, New York at Rouge 58, Montreal based artists Alan Ganev, JP King, Tim Barnard and Regimental Oneton are putting an art show together at Underworld skate shop to raise funds for their upcoming trip and promote their latest artworks in Montreal. I'm putting a few pieces in the show too - probably some never-before-seen large format prints. No sleep 'Till Brooklyn happens at Underworld, 251 Ste-Catherine Street est from 8:00pm - 3:00am on April 22. Papirmasse is having an exhibition all month long at the S.P.A.C.E. Gallery in Vermont. 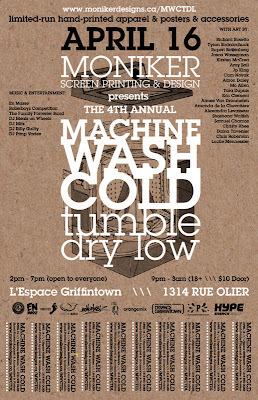 The show is up right now, and we will be hustling on down to Burlington for First Friday on May 6, 5pm - 9pm. If you're in Vermont please come say hi! 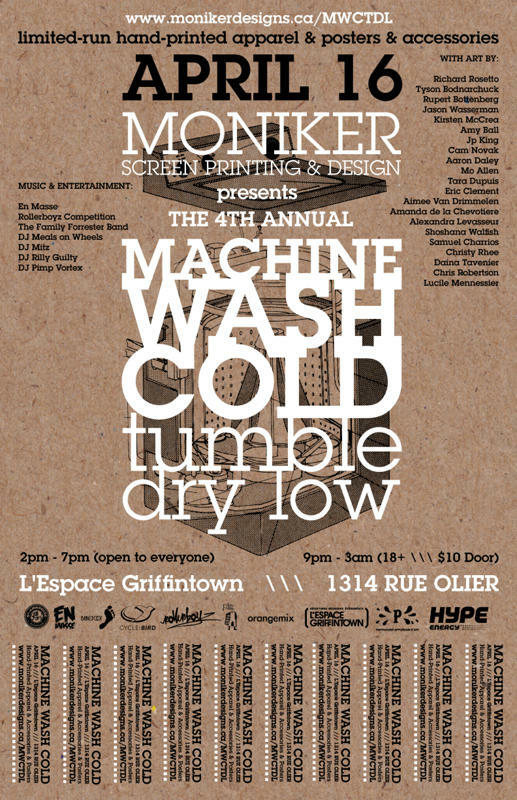 It'll be a fun chance to check out Papirmasse and get a taste of the affordable art project. I am looking forward to eating ice cream, which as far as I know is a mandatory Vermont tourist activity. Check out an article on the show here: http://www.7dvt.com, and let me know if there are other fun things I should check out while I'm down there. As always, if you come to one of my shows and we haven't met - please come say hi! I love meeting new people and haven't bitten anyone in a long time.